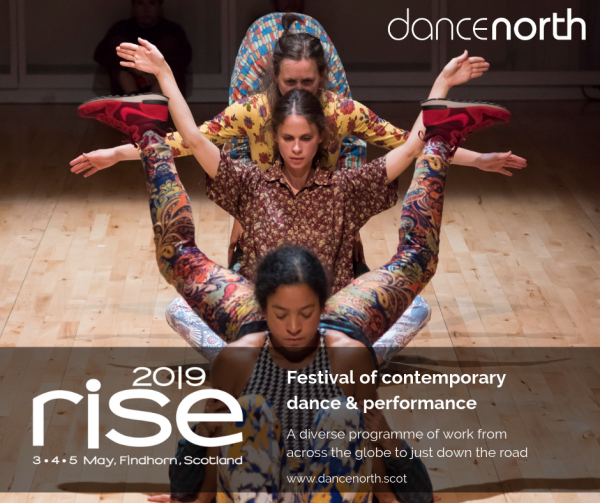 RISE 2019 is Moray’s annual contemporary dance festival held at the Universal Hall in Findhorn. From Friday 3 to Sunday 5 May, audiences will be treated to the best in contemporary dance and performance from Scotland and across the globe. This year the programme has a strong international focus, as well as themes of landscape, relationships and dance for the screen. The programme has something to suit all tastes, and we invite both seasoned dance audiences and first timers to try something new and take a punt on something different. While you’re here, why not explore the stunning scenery of Findhorn Bay or have something delicious to eat in between shows? The weekend also includes opportunities to get on the dance floor, with dance classes for all ages from babies through to adults. With something for everyone, you are certain to see something different, beautiful and unexpected at this year’s festival. Make a weekend of it and buy a Festival Pass (£60) for the dance sector which includes; FST Dance Forum and drinks on 3 May, Friday night dinner, a ticket to every performance, priority access to the Scotland/Quebec Connects reception on Saturday and a hot desk in our brand new office at the Findhorn Hive.